RANGERS completed a clean sweep of four SPFL Championship wins over Dumbarton in bright sunshine at the Dumbarton Football Stadium. RANGERS completed a clean sweep of four SPFL Championship wins over Dumbarton in bright sunshine at the Dumbarton Football Stadium in front of a 1,766 crowd. But they were shocked in the second minute when ex-Celt Mark Wilson opened the scoring with a volley into the net from a sharp angle. The Ibrox men were soon on the attack and had the better of a well contested half, with debut youngster Ryan Hardie equalising after a few minutes. But Sons had several good chances of adding to their total, particularly through shots from Dylan Easton and Garry Fleming. With the score level at half-time, the home fans were hoping their side would play even better in the second half, but it was not to be. Three minutes into the half Hardie netted his second with an overhead kick, and a few minutes later Haris Vuckic scored a stunning third goal with a powerful shot. Ian Murray's men battled on, but it was obvious where the three points were going. Their best chances were a Stuart Findlay header saved by keeper Cammy Bell, and an Archie Campbell shot which went over the bar. 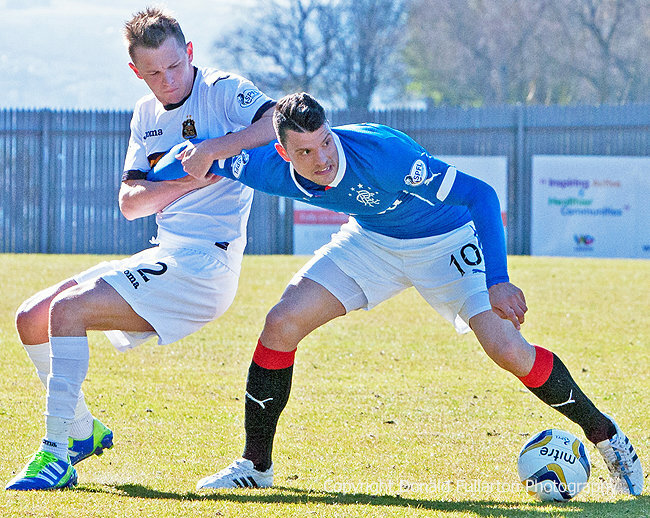 The picture shows Scott Taggart battling with Haris Vuckic.